Info: Created on Sun, 14th October . Last edited on Mon, 15th October. Congratulations! 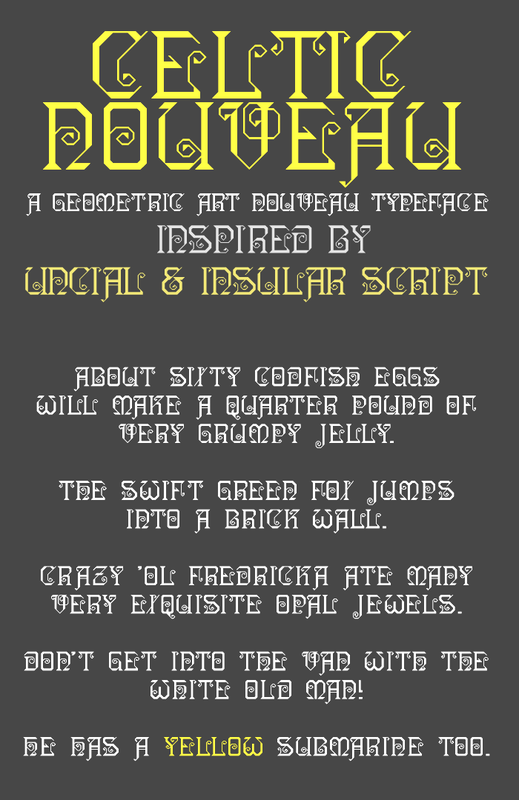 FontStruct Staff have deemed your FontStruction worthy of special mention. “STF_CELTIC NOUVEAU” is now a Top Pick. Beautiful! Not sure about the X though. ...... STRIKE 4. This is based on SALYMA ALTERNATIVE OTF. Once again your BS 'inspired by' rhetoric is laughable. The truth will always out. Yours is a geometric version of Salyma, and so why not say so, instead of trying to fool everyone on this site? Considering how many font designers there are on here, you must be either really dumb or overly arrogant to think that no-one would notice your little game. ALL WE ASK IS YOU BE HONEST. As at the moment, we don't trust any of your actions as authentic, especially considering you've been warned three times previously. Hey Audio, how many fonts did you make? I don't mean to argue, but you can always improve your future original designs by being inspired from the nuances of other fonts. I suggest you should try your hand at it, instead of hating on top picks which you think are undeserving. Hey Khalfani, under my own name 800+ font designs. Yes you do mean to argue. Thanks for your unwanted aggresssive opinion. Since when has telling the truth been classed as hating? If you don't like me exposing the truth, on someone who continuously claims that their fonts are all 100% original, and inspired by something else, other than what it is actually inspired by, then might I suggest you buy some tissues and have a good cry. Life is so unfair. Ha Ha. Now you have to show me your font designs. Why would you want someone to hide comment 6-14? All I ask for is the truth. If STF hadn't claimed in the description of this font that it is "lettering inspired by as well as trying to mimic Uncial & medieval Insular script letters" - when clearly it's a geometric version based on the font Salyma, then I wouldn't have an issue with it. The same also goes for the other three font designs he claimed were his original work, when I found them to all be exact copies of other fonts, some of which were even fontstructs. It's this brazen and arrogant attitude of STF claiming other people’s work to be his, just because he's copied it. The Fontstruct community will not tolerate this. There is an unspoken rule, as well as honesty that say’s 'If your Fontstruct is based on, or influenced by somebody else's work, then please state that in the description' - that to me is simple common sense. Rather than going around and totally plagiarising someone else's work, then giving fake and falsified information about who created it, and then sticking the finger up to the community. Worst of all he gets rewarded by getting a Top Pick! That simply belittles everyone else's hard work. Admittedly this particular font is creative, it's just the BS description is a total fabrication, but at least it's better than his previous deceitful brick for brick copies in Strike 1,2 and 3 he claimed were his originals. So at least we’ve made some progress.